National President, Nigeria Union of Journalists (NUJ), Waheed Odusile (left); Representative of Lagos State Governor, Fola Adeyemi; Former Governor of Ogun State, Olusegun Osoba; Chairman NUJ Lagos State Council, Deji Elumoye and an erstwhile chairperson of the association, Funke Fadugba, at the unveiling of NUJ Building Complex in Lagos… yesterday. Former Governor of Ogun State, Olusegun Osoba, yesterday cautioned relevant government organs against legislating on hate speeches in the country. He described calls for legislation on hate speeches as a direct attack on the journalism profession and the people’s freedom of speech and expression. Osoba stated this at the unveiling of the N90m building complex being built by the Lagos State Council of the Nigeria Union of Journalists (NUJ) on Adeola Street, Shomolu, Lagos. He charged the media practitioners and the society not to allow anything that would undermine the people’s fundamental rights to rear its ugly head. His words: “We are going through very difficult time but we have always survived. There is a serious attack on our profession. This issue of hate speeches is an attack on freedom of expression and the right of the people and it is an attack on the press. “We are dealing with statements made by the people but we as professionals, can make the people in government to realize that what we publish is one per cent of the total information that we have in our hands. He, however, explained before journalists publish anything, they consider the nation’s sensibility, adding that if anybody is going to legislate anything against hate speech, media practitioners must be ready to fight it and ensure that anything that would undermine the people was not allowed to rear its head. 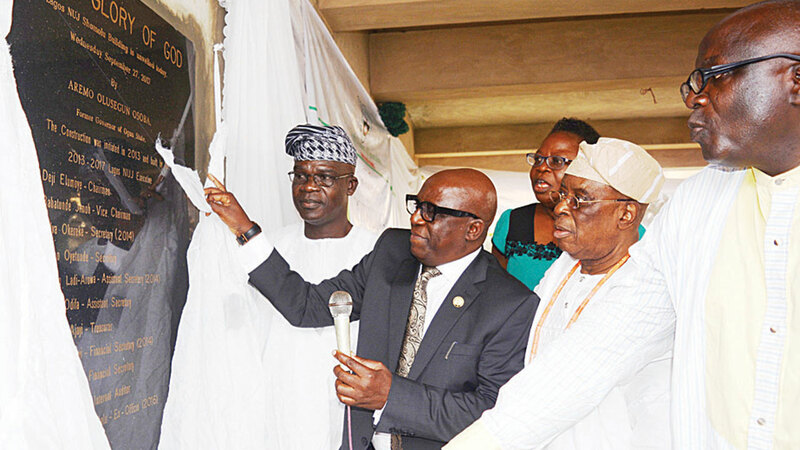 Speaking, National President of NUJ, Waheed Odusile, thanked the members and the Lagos State government for being supportive of the profession and the construction of the building. He tasked governments at all levels to learn the principles of financial prudence from the Lagos Council, which has succeeded in putting up the edifice through its Internally Generated Revenue (IGR). State Chairman of NUJ, Deji Elumoye said the two-storey building project, which amounts to N90m is about 90 percent completed with N55m spent so far and only remains furniture and finishing. Lagos State Governor, Akinwunmi Ambode, who was represented by the Permanent Secretary, Ministry of Information and Strategy, Folarin Adeyemi lauded the efforts of the council and Journalists in the state for keeping the people informed at all times.